What's New @ Plough Library: How Many Copyrights Do You Have? 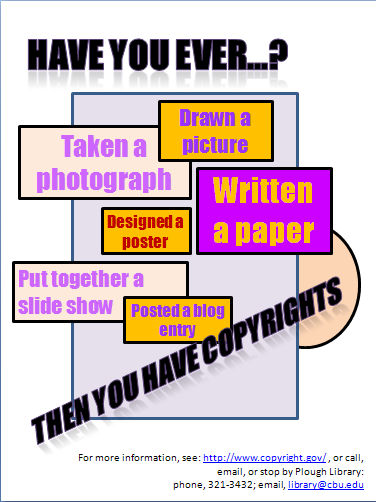 How Many Copyrights Do You Have? 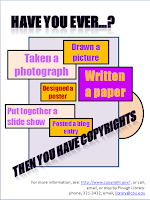 How many copyrights do you have? More than you think. Have you taken a photograph? Drawn a picture? Made a poster? Written a paper? Any creative work in a "fixed" form is not only eligible for copyright; it is copyrighted. Under current U.S. Copyright law, copyright is bestowed on authors automatically. Registration is not required (though it is recommended should you ever have to go to court over your copyrights).